This is the second in Weeks’ Lightbringer series – the followup to the Black Prism. I’ve not enjoyed this series quite as much as his Night Angel trilogy, but it is still a great read. Weeks develops his world and characters with the trademark WTF???? Weeks moment. I look forward to seeing where he goes with this. There was a recent special offer on this book so I decided to give it a go. Gaiman did say in the accompanying blurb that this book was not for everyone, and I have to say that was the case for me. I can’t even say with any certainty why I struggled to get into this book. It was original, imaginative, well written. At times, it could be violent and crude, but that has never turned me away from A Song of Ice and Fire. I've had my hands on the Kobo Glo for a few days now, and it is a very nice device. I took some pictures to compare it with my Kobo Touch and Kindle Touch. To my eyes, the Kobo Glo's screen is noticeably lighter than the Kobo Touch's and on a par with that of the Kindle Touch, making more of a contrast between the screen and text. With its 1GHz processor, page turns on the new Glo are considerably faster than on the Kobo Touch and the Kindle Touch. You may notice from the images that the Kobo Glo has dropped the physical home button. Personally, I'd have preferred that they keep it. Access to the Home screen is now via on-screen menus. The Kobo Glo comes with a slightly updated UI, which, according to the forums, and my own experience, is still rather buggy. Once or twice I noticed that the device got stuck on a page and I had to turn it off to get back to reading. I imagine a firmware update will be coming soon to fix this. It's annoying, but not a deal breaker for me. On my device at least the light is not perfectly evenly distributed. There is shadowing at the bottom of the screen. Kobo has quite cleverly got around this by reversing the menu bar at the bottom so it is white on black to disguise that somewhat. I understand from the forums that some people find the shadowing too irritating. My own feeling is that it doesn't bother me at all, and that the Comfort Light is a great improvement over book lights or less than ideal ambient lighting. One thing on which I am undecided – whether or not to leave the Glo light on in all lighting conditions. Amazon recommends that you do so on their Paperwhite, whereas Kobo suggests only when you need it. In any case I've had it on a lot and noticed no significant drain on battery power. 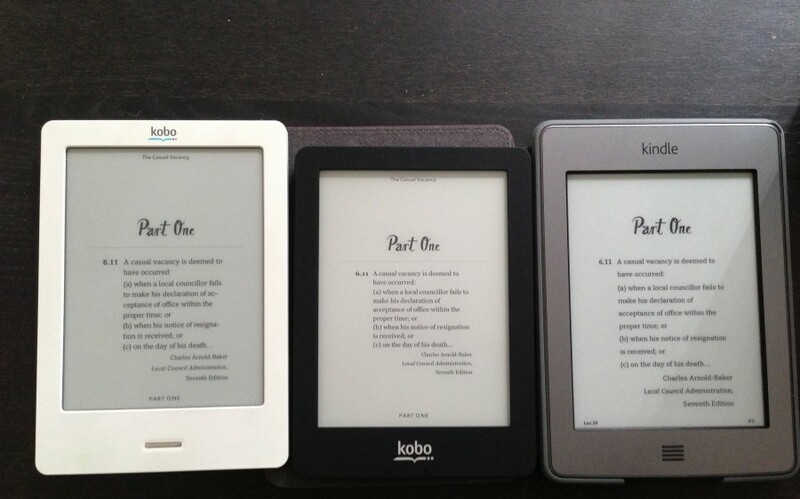 All in all the Kobo Glo is a great upgrade to the Kobo line. 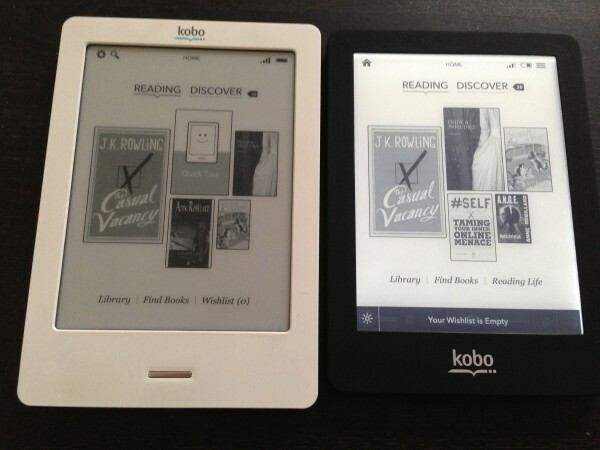 If you're buying a first Kobo, the extra $30 for the Kobo Glo over the Kobo Touch is worth the expense in my opinion. Of course, as an entry level ereader, for $79 you can also get the Kobo Mini which looks so cute. If you already have a Touch and are thinking of upgrading that's probably more a case of personal preference. If you read a lot in less than ideal lighting conditions it might be a great purchase for you. Sigh. I really should not have spent yesterday evening looking at reviews for the Kindle Paperwhite eReader. They unanimously give the device a “glowing” review. Now I really, REALLY want one. This is a device I use on a daily basis, so it’s something I don’t mind paying for. In addition, it appears Amazon has discontinued the Kindle Touch, so there will be no more software updates. That is my excuse and I’m sticking to it! As I live in Canada, I am unable to purchase directly from Amazon, so I’ve had to go through shopereaders.com. They called me yesterday to confirm my order, and I will likely receive it the first week in November. Their first batch is 20, and I’m the 30th preorder. Other than the front lighting, new screen and capacitive touch, I’m very excited about the updated UI. From what I’ve seen on the review videos, it looks so much nicer with the book covers. On the other hand, I won’t have to wait as long for my Kobo Glo. Tracking indicates it’s halfway between Mississauga and Montreal, so I imagine it will arrive tomorrow. I’m very much looking forward to seeing it in person. I have been searching the web for reviews/unboxings of the Kobo Glo, but there seem to be very few. In a way, it’s sad that it’s been overshadowed by the Kindle Paperwhite launch. Naturally, I will post a review once I have it. I could have really done with my Kobo Glo this morning – I was awake at 4am and wanted to read. I didn’t want to wake my husband, so ended up reading on my Nexus 7 tablet. On a different matter, I mentioned in a recent post that I’d been blown away with Amazon’s new Whispersync for Voice and I’ve been experimenting with it. In fact, I’m enjoying it so much I’ve even reactivated my Audible account. The book with which I most appreciated using it was Brent Weeks’ The Blinding Knife. I really got into this book, but as we were expecting weekend guests, I didn’t have time to sit and read a lot. With the audiobook, I found I was able to listen to it while i was working around our house, switching to my Kindle when I took a break. Tor has decided to delay the publication of the final Wheel of Time as an ebook until three months after the hardback – boo, hiss, Tor – and as I really don’t want another hardback, I will be getting the Audible version on release day. I will not be doing my Most Difficult Books this next week or two as I’m busy with other things, but will catch up at some point. My next post will likely be the review of the Kobo Glo – see you then!